CHASING FOOD DREAMS: Galaxy Wonderland: Inspire Yuna Today - What Makes Malaysia A Wonderland? Galaxy Wonderland: Inspire Yuna Today - What Makes Malaysia A Wonderland? What makes Malaysia a Wonderland? 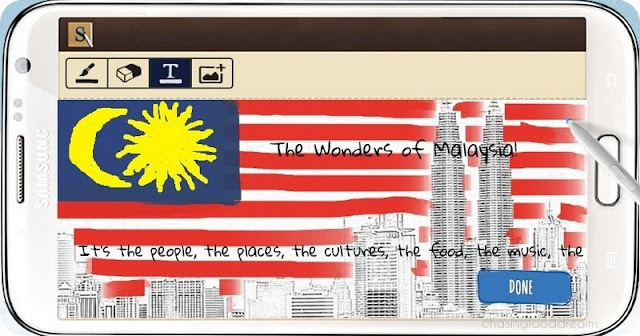 Be inspired, be patriotic, be amazed… Malaysia, our country of wonders! After its much success of the Sparkle Project, Samsung and Galaxy Note II ambassador, Yuna Zarai will take on the challenge to on its latest project, Galaxy Wonderland. 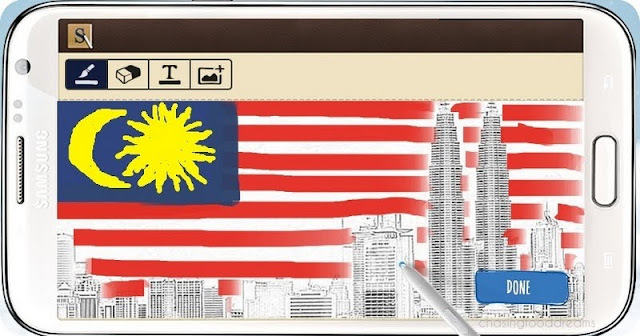 The musical voyage brought to life on Samsung’s latest flagship, the GALAXY Note II, is set to ask the nation to be creative and paint their inspiration of what a Malaysia Wonderland is. A truly unique artist who embodies the unique and inspirational stories through her songs, Yuna will be gathering all the nation’s representation of Malaysia into a music video produced with the Galaxy Note II. Check out the gorgeous whimsical illustrations designed in the rich portal designed with Galaxy Note II! Let’s dive in to what I see that makes Malaysia a Wonderland! The People – a nation is always made up of its people. A rich and multi-cultural race living in harmony, eating together, laughing together, fighting together and more is a wonder of Malaysia. The Food – a popular wonder never fails to amaze me. Choices are just an abundance of various races’s cuisine melted together in one bubbling pot of sumptuousness! 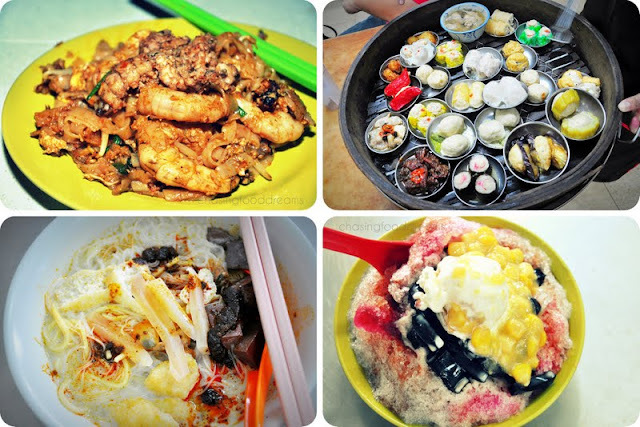 Nasi Lemak, Satay, Char Keuy Teow, Ice Kacang, Dim Sum, Teh Tarik and more are just among the few wonders of Malaysia! Let’s not forget the Smiles! 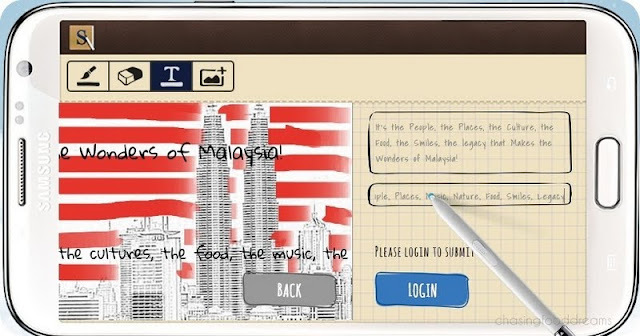 and make sure to leave a trace of your inspiration on the wonders of Malaysia. I first download an image for my creation of a sketch of the city. Then I finished up with colors and design, going patriotic all the way! Chasing Food Dreams’ representation of the Wonders of Malaysia! For more information on GALAXY Wonderland and the new Samsung GALAXY Note II, please visit GALAXY Wonderland’s portal, galaxywonderland.my or visit Samsung Mobile Malaysia Facebook page at https://www.facebook.com/samsungmobilemalaysia. Oh.....I want to raise chickens for eggs and everyone keeps asking me what I will do with them when they stop laying. I don't think I could have done this. I eat meat, but I used to be a vegetarian for about 7 years. I'm still squeamish when I think of where my meat is coming from. I try to stick with seafood...I don't know why, but I just don't feel the same way about fish.